Cabo San Lucas (Los Cabos) is undoubtedly one of Mexico’s best family vacation hot spots, and for good reason. It sits at the southernmost tip of the Mexican Baja peninsula, where the Sea of Cortez meets the mighty Pacific Ocean. “Cabo“, as it is known by locals as well as many who have traveled there, has something for every family member to enjoy. And also be sure to check out our post Fun Family Activities in Los Cabos Mexico here. For more about a family vacation in Mexico; check out our posts on Cancun Family Beach Vacation, Insider Tips for Cancun Family Vacation and More Family Friendly Activities near Cancun. Also be sure to check out our post on the Best Family Resorts in Guadalajara here. And our Guadalajara Family Activities post here. Playa Medano, the main beach is one of the great people watching spots in all of Baja, maybe the world. Quiet Playa del Amor, aka Lover’s Beach, is just a short boat ride from the main beach away and can sometimes be visited without any nearby company. There are countless quiet coves, where you’ll most likely find no other footprints in the sand, on both the Pacific coast and the shoreline of the usually glassy Sea of Cortez. The beaches in Cabo make for the kind of vacation that real beach lovers have always dreamed of. Snorkeling at either of the beautiful bays of Santa Maria or Chileno may have been the very reason that snorkeling was invented. Los Cabos has plenty of beautiful beaches, but the currents can be quite strong, so take your kids to the most swimmable ones. Especially popular in San José is Playa Palmilla; in Cabo San Lucas, head to Playa El Médano. Along the Corridor, Playa Santa María and Playa Bahía Chileno are your best family-friendly bets. Just got back and we loved it ! My husband, child & I just got back and really enjoyed our stay at Dreams. The grounds were immaculate, rooms extremely spacious, beautiful mostly equipped with microwaves, and the service & attention around the pool & beach area from waitress & bartenders were great. You really get a bang for your buck staying at Dreams with all the little extra’s included in the all inclusive rate. I.e. champagne greeting upon arrival, room service, minibar replenishment, & replenishment of toiletries daily. The room was freshened up & minibar stocked every night during turn down service. There was a shuttle service that was offered at the resort which was a big plus for us & was a fraction of what a cab would cost. It took you to the local shopping areas and marina area every hour on the hour. We found it extremely convenient especially with traveling with a small child. Their fleet of shuttles were very clean, well air conditioned and never over crowded. The food wasn’t bad and the waiters were extremely accommodating to my child which made us happy. It was also helpful that breakfast hours were extensive & there was something opened at all times for our little picky eater. They had outdoor movie nights right off the beach, a bungee trampoline for kids, pool entertainment & activities for adults everyday, nightly entertainment & an onsite photo crew which took amazing professional family photos on the beach (only if you request the service)! The spa was great! We would definately stay at this resort again and highly recommend this place for families! The Capella Pedregal is situated right on the beach, 29 miles away from Los Cabos International Airport. If you’re looking for the Top Hotel Deals in Los Cabos click here. To avoid traveler’s diarrhea, stick to bottled beverages (even for toothbrushing) and avoid uncooked or street food. 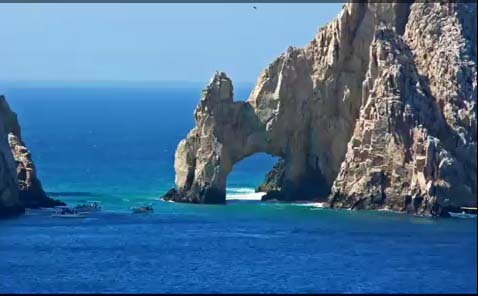 I sincerely hope you and your family get a chance to visit Baja Los Cabos Mexico, it will surely leave you with many fond memories for years to come. If you’ve been on a family vacation to Mexico– leave us a comment about your adventures, we’d love to hear about it!